Yes, not worth the effort. I'll try and make it so custom icons can be easily added to the bl-fortune call, for users who don't care. As a sidenote it's a bit unfortunate if a fortune is too long and the notification disappeares before someone finished reading. but eventually decided to just leave it to the user's notification settings. We could set a time of, say, 20000 ms (or even longer) just for the fortunes though. It wouldn't affect other notifications. Next time you add something, I can do a 'git pull' to the master branch, merge that into 'helium', update the changelog and a new package will be ready to release. *) The notify-send title is '...' , would something else be better? *) Let's look how the messages appear and see if we should do any preformatting in bl-fortune before sending them to notify-send. *) It's not necessary to use bl-fortune to see these; regular 'fortune cbbl' works too. *) README.md is in the docs, although some of it doesn't apply to the Debian package. I've left out mk.sh, though, because it doesn't have anything to do now the files are installed to /usr/share/games/fortune. *) This package isn't in the BL repo yet, but once the name is finalized, and the other devs agree, then it can surely go in. That's correct. However if it is set to a high number, it takes too long to disappear for short fortunes (if someone does not click on it). ^ the call to bunsen fortunes could easily be wrapped in a script that calculates the timeout. click the links johnraff provided, there has been some thoughts already. maybe that could be your contribution? yes, i'll keep posting soemthing like "added & pushed" to the quotes thread, just like i've been doing. Considering the number of people who miss the CrunchBang>Muppets>BunsenLabs connection, I wonder how many would pick up on flask>Beaker? Also, the grey image is a bit dry for an entertainment widget, no? i think you're absolutely right there. ^ the call to bunsen fortunes could easily be wrapped in a script that calculates the timeout. The script bl-fortune already exists, so it would be easy to put a bit of extra code in there. @ohnonot I was going to ask if the deb worked OK for you, but forgot you use Arch. ^ have to fire up my virtual machine for that, maybe tonight. As this is your project @ohnonot, I'll leave the final choices to you, and just apply them. @ohnonot how shall we move this forward? sorry, i think i misread your previous post here; the final choices about what? i can write a wrapper that calculates the time out. i just had a look; the bl-fortune script does not seem to exist yet. i have not gotten around to testing the .deb yet :redface:, but my sommer holiday starts today and i certainly have more time now. i think it goes fairly well with the paper icon theme and a dark background. afaiu, i don't have to do anything about the .deb packaging. btw, johnraff, i'm moving away from github. definitely. sources will be available on framagit.org/ohnonot or notabug.org/ohnonot - both use git - which would bunsenlabs prefer? Any git repo which can be accessed via the web from a local git will be OK - so probably either of those. You don't have to write anything new - I think the .deb does the job now as it is, it just needs tweaking in accordance with your preferences! Icon: OK it shall be done. 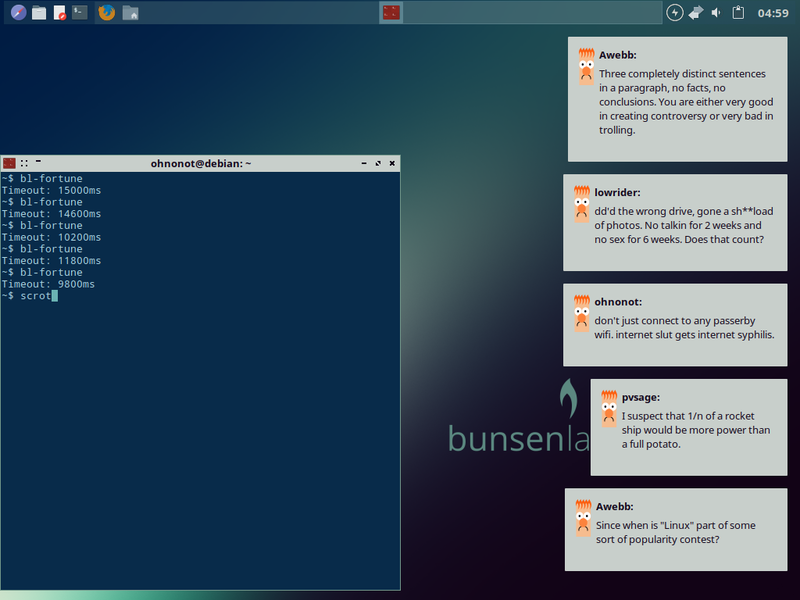 The bl-fortune script is in debian/bin: https://github.com/BunsenLabs/fortune-m … bl-fortune All your files are imported as-is with a 'git pull' and all the packaging is done in the debian directory. The fortune data-base is automatically compiled from the current cbbl at the time the package is built. If you think the display time needs to be adjusted in accordance with the length of the quote, then if you'd like to write a bit of code we can add it to bl-fortune. Now the default is 20s - the question is whether that would be annoyingly long for short quotes, or not enough for long ones? i think the package should be called "bunsen-fortune" or whatever is in accordance with bunsenlabs naming. i think the fortune notification works best without a title. But i can make this an option in the bl-fortune script. as i said, starting in less than 24h i'll have more time for this. ^OK I'll reconfigure the BL repo to pull from notabug. I added the modified bl-fortune script to my repo, in a separate bl/ folder. works well for me, but please test some more because i use dunst which might behave somewhat differently to bunsenlabs' notifier. there's very likely to be more commits to that, stay tuned! in the end, i think i prefer nore's beaker icon. OK I'll hold off doing anything else till your repo has settled into its final form. preliminary tests in a Helium VM turned out fine so far. symlinked the bl-fortune script to ~/bin. uncommented the last line in autostart. and logged out/in a couple of times. - are the timeout values ok? - is the icon ok? - why are notifications on the top right, where they cover the conky? - are there enough cbbl fortunes so that this doesn't get old really fast? (*) i decided to split the notification summary off at the first colon ':' - this required very slightly editing a few fortunes, and me to stick to that format from now on. so maybe your provisional .deb is out of date now. Thanks for testing and improvements! You did this to override the package's bl-fortune with your more recent one from the repo, so you could test your changes, right? Looks good - I like your change to the message formatting. Did the display times work out OK for you? I'll give your new bl-fortune script a run here too. I did wonder this myself to be honest. I can offer a Tao-te-ching database to expand it a bit (ancient discussion with Rhowaldt on #!) and maybe we need to quickly drum up some more contributions, or look elsewhere for some more fortune files to add? Doesn't recent posting do that anyway? We're still on the original topic, I guess. maybe your provisional .deb is out of date now. Yes I'll put up a newer one for people to test soon. the fortunes used are the ones from the .deb. Did the display times work out OK for you? #~ It is said that average reading speed is ~250 words per minute for adults. #~ That means 4.166667 words per second. 'delay' is configurable, 'add' not (yet), and beyond that one can still choose the -t option for a fixed expiry time. actually now i think about it i'm not sure 'add' is really necessary, i guess i'll do some more testing to feel that out. yes, fortune can pick from multiple databases. the option is alreadythere in bl-fortune. maybe something to mention in ~/.config/openbox/autostart. so nore's beaker face it is, then? i think they effectively already gave permission to use it, but i'll pm them nevertheless. I tend to think a certain added fixed time will be needed just for the time to notice that a notification has popped up, before even starting to read it. In fact, if the fixed time is long enough, I'm not sure if it's really necessary to adjust it for fortune length at all. Would a bit of lingering be that annoying? It's your call though. That sounds like the easiest way to go. In fact, if the fixed time is long enough, I'm not sure if it's really necessary to adjust it for fortune length at all. Would a bit of lingering be that annoying? It's your call though. we had that discussion here on the forums. the quotes differ a lot in length. of course one can always click on them if they linger too long, but the default 20s isn't really enough for the longest. in any case, it's all user configurable - both the per-word delay, or the fixed timeout. Fair enough - let's do it. From my point of view, do what you like with it (CC0), it was just a quick scratch made during conversation. But as it is recognizably based on a trademarked character owned by Disney, I hope it counts as a "derivative work" or "transformative use". Screw it, they can sue us. oh, i never thought about that. i just researched if we're violating anyone's rights, and it's messy. of course most articles talk about US laws. nevertheless i will rename the icon to something not beaker, and that is that for me. if you don't mind, i'd prefer to not put a seperate license on the icon?